On 5 April 1906 Mount Vesuvius erupted killing more than 100 people and devastating the city of Naples. Mount Vesuvius is a volcano in the Campanian volcanic arc in Southern Italy. It has erupted many times, the most famous of which was that of AD 79 which destroyed and buried the Roman city of Pompeii, among others. It is regarded as one of the most dangerous volcanoes in the world because of its proximity to populated areas. The 1906 eruption ejected the most lava ever recorded from a volcano of its type, and led to the relocation of the 1908 Summer Olympics from Italy to the United Kingdom. 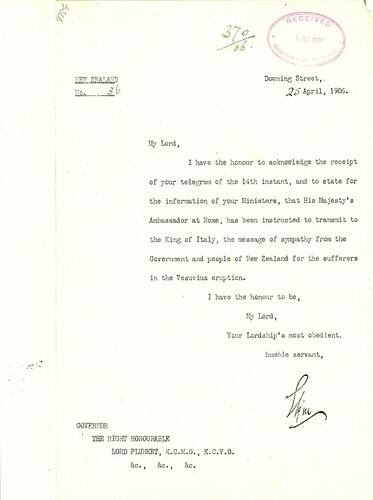 This letter recognises the arrival of a telegram which was sent from the New Zealand government to the Secretary of State for the Colonies in London expressing sympathy for the people affected by the disaster. It states that the British Ambassador in Rome had been instructed to convey these sympathies to the King of Italy, Victor Emmanuel III. Archives reference: G1 Box 146 1906/370 R24528232. 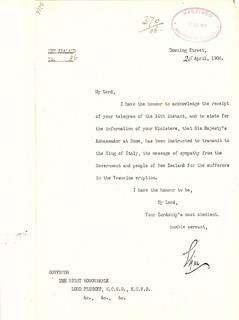 Material supplied by Archives New Zealand.